In 1921 Mr. J. Ed Harris, local agent for Mount Vernon-Woodbury Mills, Inc., in Tallassee, originated a plan for a community library. Originally, the library was housed in a small “Stub” of a room on the south end of the library, but in 1922 the library collection was moved into the “sunroom” of the clubhouse, where it has been housed ever since. The library has grown as the result of purchases by the mills as well as from books donated by private individuals, or simply as friends of the library. The first librarian was the minister of the E. Tallassee Methodist Church, the Rev. W. E. Bryant. In 1922, Miss Mary Lou Martin became the first full time librarian, and continued to serve until her retirement in 1948. She was succeeded by Mrs. Ruby Lanier, who served until 1985. In February of that year, Mr. W. C. Bryant was appointed following Mrs. Lanier’s retirement and continued to serve until 1999. Mr. Bryant was succeeded by Mrs. Sharon Johnson, current librarian. 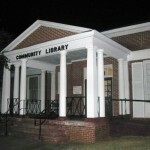 In March of 1978, Tallassee Mills donated the library to the City of Tallassee and the facility became a public library, no longer owned by the Corporation. Before donating it, a new wing was added on the south end of the building. This wing for some time housed a local museum under the direction of Mr. W. G. Eubanks. In 198, plans were initiated by the library board to turn the museum wing into a reading and reference room. With two grants from the Mildred Weedon Blount Educational and Charitable Foundation, Inc., the room was remodeled, refurnished, and named the Mildred Weedon Blount Reading and Reference Room. It was formally opened in November 1989. The building appears today as it was remodeled in the late 60’s. Reports of Paranormal activity include smell, full apparitions, and unexplained noises,being watched.